high-pressure oscillations by forming more stable emulsions in the porous media. Among Enhanced Oil Recovery (EOR) methods, emulsions are used as high viscosity fluids [1-3]. These fluids improve piston-like movement of injected fluid in two-phase flow systems . Actually, water in oil emulsions can be formed in different cases: during water injection and/or water-based chemical EOR processes, due to the presence of asphaltenes and naphthenic acids in the oil, and during the water injection process in the presence of a surfactant and alkaline [3, 5-6]. Although emulsions have been noticed for the EOR processes, they can reduce the oil recovery due to the blockage of the pore throats, which mainly results from their instability and type shifting (changing from water in oil to oil in water emulsion and vice versa) [7-8]. Reservoirs with water in oil emulsions may be stabilized under a thin film that surrounds the water droplets. The film can be created by asphaltenes exist in the crude oil . In the presence of asphaltene, the interfacial tension between water and oil decreases, indicating that asphaltene adsorption on the surface and formation of the three-dimensional film, slows down the accumulation of water droplets . Interfacial tension between crude oil and formation water depends on different parameters, including salt type and quantity, the presence of surfactants and other chemicals such as nanoparticles in the system [12-15]. In addition, emulsions can be formed spontaneously in hydrocarbons with special compounds . The reaction between acidic and alkalic components of the crude oil produces surfactant on the interface between water and oil [16-17]. This in-situ formed surfactant enclose spread phase with a strong interfacial film and helps the formation and stabilization of the emulsion [18-20]. Emulsions are classified according to different criteria. In traditional form, the emulsion is composed of two immiscible phases, including water and oil, wherein one of them is considered as a dispersed phase [21-23]. To be detailed, the dispersed phase usually refers to the internal phase, whereas the continuous phase is external. Depending on which phase is dispersed, emulsions with different physical characteristics are formed [24-26]. Emulsions are generally formed by the electric repulsion between the particles dispersed in the continuous phase, or by a film of the continuous phase which prevents dispersed droplets from interacting and accumulation. In this regard, the stability of the emulsions is reduced by decreasing the capacity of the film that formed by the crude oil. The addition of acid, base, surfactant, and salt can minimize the film thickness and alter its physical properties [27-31]. Injection of nanofluids into the oil reservoirs is one of the EOR techniques that have recently attracted great attention . This attraction mainly results from their physical properties that improve production from oil reservoirs . Nanoparticles improve the oil production by changing the rock wettability, reduce interfacial tension between oil and water, and oil viscosity, and also asphaltene precipitation. On the other hand, because of the absorption characteristics and the surface-to-volume ratio of nanoparticles, they are also able to form and stabilize the emulsions [34-37]. As described, the study of the formation and stability of emulsions in the presence of nanoparticles is of particular importance, which has been investigated by many researchers. Mansah et al. (2013) examined the effect of aluminum (III) and copper (II) oxide nanoparticles on the stability of emulsions. They concluded that the stability of emulsions reduces with the presence of hydrophilic nanoparticles in the system and, as a result, the water and oil separation would be easier . Al Otaibi et al. (2013) concluded that the emulsion of carbon dioxide, nanoparticles, and water is stable. They also reported that the most dominant parameters in the stability of the emulsions are the nanoparticles concentration and volume fraction of water . Amarfio et al. (2012) examined the effect of nanoparticles on the stability of emulsions at reservoir conditions. They concluded that surface charges are important for the stability of the emulsions and, for this purpose, the pH adjustment of the solution seems to be necessary . Pi et al. (2015) investigated the increase in the stability of emulsions by adding nanoparticles in the glass micro-model experiments. Their results showed that nanoparticles have the potential to increase the thickness of the emulsion layer and improve the mobility ratio. Heavy oil is also emulsified during the injection of stabilized emulsions with surfactants and nanoparticles. They stated that such emulsions, which were stabilized by nanoparticles and surfactants, would produce 40% of the original oil in place during the EOR process . Kim et al. (2016) measured the amount of oil in brine emulsification by using silica nanoparticles and four types of surfactants (cationic, anionic, bipolar ion, and nonionic). They concluded that despite the low cost of providing such emulsions, they are very efficient . Griffith et al. (2016) studied the effect of mineral oil production during the injection of pentane in water emulsions, which were stabilized by nanoparticles and surfactants. During the core flooding experiments, they concluded that up to 82% of the original oil in place would be produced in this way . In this study, a mechanistic investigation of three metal oxide nanoparticles (ceramic) and their effect on the improvement of the oil production from reservoirs has been discussed. In this regard, first, the formation and stability of the emulsions in the presence of nanoparticles were evaluated under static conditions. Then, the variations in the pressure difference between the inlet and outlet of the carbonate sand pack were investigated by a series of nanofluid injections. Finally, the end, the formation and stability of the emulsions during nanofluid injection were analyzed by monitoring the pressure fluctuations. The crude oil used in this research belongs to one of the Iranian oil reservoirs with 21 °API and 7% asphaltene content. The composition and SARA analysis of the crude oil are presented in Table 1 and Fig. 1, respectively. The formation water used in saturation process was synthesized in the laboratory according to the analytical results (Table 2) obtained from the reservoir brine. Moreover, the seawater of the Persian Gulf was used for water injection as a secondary method (Table 3). All the features have been noticed for Titanium dioxide are also observed in titanium oxide nanoparticles. However, the nano-sized titanium oxide is more effective and efficient due to the smaller size and therefore the higher surface to volume ratio. In fact, when the size of the TiO2 particles decreases to nano-scale, their photocatalytic activity increases due to the increase in the effective surface area of the particles. Generally, the TiO2 nanoparticle is chemically stable and inexpensive. The results on light radiation of this nanoparticle have shown that the cavities produced are highly oxidizing. The SEM analysis and further properties of this nanoparticle are presented in Fig. 2 and Table 4, respectively. Modified Silica nanoparticles are very effective in the formation of oil in water emulsions and carbon dioxide in water foams. The foams produced in this way are even stable at 95 °C and salinity of up to 10%. The SEM analysis and further properties of this nanoparticle are presented in Fig. 3 and Table 5, respectively. The most important feature of this nanoparticle is that it can noticeably reduce the interfacial tension between oil and water, especially at high pressures . The SEM analysis and detailed properties of this nanoparticle are shown in Fig. 4 and Table 6.
where ∆Gform is the variations in Gibbs free energy, ΔA is the surface variations, γ12 is surface tension, T is the temperature, and ∆Sconf stands for the variations in the configuration entropy. The rheological properties of emulsions, including stability, depend on various factors such as particle size distribution, surface film strength, average particle size, and other characteristics that change with time. Changes in the microstructures of the emulsion are expressed in terms of interactions between the droplets and consequently stability. Ostwald ripening is the deposition process of smaller particles onto the larger ones in the solid, liquid and gas systems. Crystal growth, which is the growth of the average particle size, is accompanied by the consumption of small particles in the system. These small particles first dwindle and eventually disappear. In the absence of any stabilizer, the emulsion becomes unstable with aggregation, coalescence, Ostwald ripening, or a combination of these processes. In the preparation step, solutions containing 30 vol.% water and 70 vol.% oil were mixed with 0.1 wt.% of various nanoparticles and seawater. First, the nanoparticles dispersed in aqueous solution using Ultrasonic Probe DA UP-400. Then the oil was added to the nanofluid and shaked with 250 rpm rate for 24 hours. To investigate the dispersion rate of water droplets in the oil phase, a sample of each emulsion was monitored by a high magnification camera. Fig. 5 shows the distribution of water droplets in the oil phase in one of the stability tests. Finally, the number of dispersed water droplets in different sizes were calculated by the software. Images were taken from different locations of the sample and the outlier data were removed for accurate analysis. If the emulsion shows a weak stability and obtained data shows variation in water droplet distribution, these data will be averaged and analyzed by integration. Fig. 5a is a picture from the high magnification camera that is taken as input to the image analysis ImageJ software. The method is based on the conversion of the image into an 8-bit image and then elimination of image fluctuations with the ImageJ software. Fig. 5 shows the two-step analysis of a typical image. The procedure begins with the conversion of the raw picture (Fig. 5a) to an 8-bit picture by the software and the elimination of the outlier points within the image (Fig. 5b). A droplet circularity of 0.9 to 1 in the setting of the software was then adopted for more accurate analysis. Fig. 5c shows the final analyzed picture as the output of the software accompanied by a histogram graph and an excel file containing the number and area of droplets. The sand pack preparation process was based on the filling of a high pressure-high temperature (HP-HT) steel cylinder with calcite grains and subsequently the compaction of them in the cylinder. The purity and particle size of the calcite grains were 99% and <100 microns, respectively. The permeability and porosity of the porous medium were measured as ~3.45 Darcy and ~40%, respectively. In order to simulate the injection of fluid into the reservoir, the sand pack flooding experiment was conducted, which is schematically illustrated in Fig. 6. The amount of oil recovery, as well as the pressure drop of the system, was recorded during the injection of nanofluids into the system, which both were then used for evaluation of the formation and stability of the emulsions during the nanofluid injection. As noted earlier, solutions containing 30 vol. % water and 70 vol. % oil was mixed with the different nanoparticles. Fig. 7 shows the microscopic views of emulsion samples for different solutions containing nanoparticles. It is observed in Fig. 7 that the fluid with iron oxide nanoparticles has more distributed water droplets in the oil phase. The number of small droplets in the emulsion is a good indicator of emulsion stability. The formation of a stable emulsion depends on the free energy variations, which is associated with the transfer of solid particles from the continuous phase to the dispersed droplets. If free energy variations are negative, emulsion formation is spontaneous. According to the thermodynamic analysis carried out on the transfer of an oil droplet into the water droplet, it was observed that only hydrophilic particles with a contact angle of <90° can be transferred. In real systems, the particles accumulate at the interface of oil and water and contribute to the stability of the droplets. Nanoparticles, due to their physical properties, such as high adsorption and surface-to-volume ratio, can stabilize the emulsions by aggregation on the interface between water and oil . In this regard, iron oxide nanoparticles have three outstanding features that can increase the formation and stability of emulsions. These nanoparticles quickly adsorb the formed droplets during homogenization, reduce interfacial tension, and form a firm layer that prevents the droplets from accumulation. As described earlier, the saturation process was based on the injection of formation water and then the crude oil into the carbonate sand pack with a rate of 1 ml/min. Fig. 8 showsthe pressure variations between the inlet and outlet of the sand pack during the oil injection. As it is shown in Fig. 9, the pressure drop in the system is reduced to 2.9 psi over a 150-minute injection of titanium nanofluids. The maximum differential pressure in the system is related to seawater, which is decreased to 7.7 psi after the 140-minute injection. According to the results, emulsion with iron oxide nanoparticles was the most stable among the samples. According to previous studies, the reduction of asphaltene precipitation in the presence of iron oxide nanoparticles is as high as possible. On the other hand, titanium oxide nanofluid reduces the capillary pressure, and consequently, decreases the pressure drop in the system by altering wettability to water-wet condition, as well as the sharp decrease in interfacial tension. Therefore, total oil recovery is the result of all mechanisms related to the formation and stability of the emulsion. 1. Oil droplets deviate from the flow path to another path by closing the pores and subsequently improve the oil recovery. 2. Dispersed oil is produced along with the aqueous phase. Water in oil emulsion can produce oil by closing the water channels, which is due to its high viscosity. Given the concept of Ganglia Dynamics, the movement of trapped emulsion droplets in the pore throats is required a critical capillary force . As viscous forces are enlarged by the flow of continuous fluid, sufficient force is provided to overcome this capillary force. The force that drives the oil droplets is called the critical capillary force. Below the critical point, trapped oil droplet deviates the flow path and improves sweep efficiency . During the injection of iron oxide nanofluid, intense fluctuations have been observed in pressure difference in the system. In fact, pressure fluctuations indicate the blockage of the pore throats. This blockage requires enough forces to overcome the high capillary force. Therefore, it is clear that high-pressure fluctuations are observed following oil trapping and its release. Generally, the emulsification process depends on the interfacial tension between water and oil. The less interfacial tension, the easier the process. Acidic components in crude oil cause low interfacial tension and, as a result, facilitate the emulsification process. On the other hand, the presence of asphaltenes in the crude oil increases the stability of the water and oil film, as well as the stability of the emulsion, which is mainly due to their surface activity properties that result in the deposition of them on the interface. The extracted oil exposure with nanoparticles at the interface between water and oil will not easily form the emulsion, because the interfacial tension between nanofluid and this type of oil is relatively high . Interfacial tension reaches its minimum in a specific range of nanoparticle concentration . When nanoparticles concentration is outside this range, interfacial tension increases sharply. Therefore, in order to select the optimum concentration, different factors, including the nature of oil, nanoparticle, the water phase, and salinity, should be considered. Most of the reservoir rocks are calcite and strongly oil-wet. As a consequence, wettability alteration is a good treatment in oil production from these types of reservoirs. The stability of water boundaries on the water-oil-rock interface is an important factor in determining the reservoir rock wettability. The pH of connate water in carbonate reservoirs is typically basic and is ~8. Carboxylic groups in crude oil act as surface active agents on the interface, which are expressed with the acid number. This number is determined by the titration of crude oil with potassium hydroxide. Generally, connate water has a high concentration of calcium and a few ions affecting the interface with a negative charge. As a result, the carbonate surface has a positive charge and the water film between rock and oil will be unstable due to the negative dispensing pressure. The oil then exposed with carbonate surface and the carboxylic particles in the oil adsorb onto the rock surface, which leads to the more oil-wet condition. The particles inside the fluid have a surface charge and are always surrounded by a high concentration of ions with opposite charge. Therefore, an extra layer of this surface surrounds the particle and creates an additional layer around it. When the particle moves inside the fluid, the surrounding layer also moves with the particle. It is possible to imagine a hypothetical distance between the particle and the fluid medium, i. e., this supposed distance is the same layer that surrounds the particle. This distance is called the potential hydrodynamic distance that generates Zeta potential [46-47]. Charges on the interface of water-based nanofluid–oil and water-based nanofluid–rock are the key elements controlling the stability of the water film between oil and water. A stable and thick water film enclosed between two surfaces results in a water-wet surface. Unlikely, unstable thin water film will alter the wettability of the rock toward the more oil-wet condition. Therefore, the rock wettability is dependent on the sign and the magnitude of the electric charges on two interfaces, which is based on the attraction or repulsion electrostatic forces between the surface of brine–oil, and also brine–rock. The carbonate rock, especially the calcite, has a positive charge due to the presence of calcium ions. Crude oil contains polar compounds such as negatively-charged carboxylic groups . Over time, the oil pushes water from carbonate surface which results in the deposition of carboxylic particles on the rock surface and thus, the wettability alters toward the oil-wet condition. Nanofluid injection returns this process to initial condition nearly and results in a reduction of oil-wetting condition due to the separation of oil from the rock surface. This process is carried out by nanoparticles in the water. Water in oil emulsion was prepared freshly before the carbonate sand pack flooding. As described earlier, these emulsions were prepared by three mentioned nanoparticles and seawater. At first, the porous medium was saturated with formation water and then it was injected with emulsion. The injection rate of the emulsion was considered as 0.2 ml/min. Emulsion injection after water saturation was carried out in order to reach irreducible water saturation in the porous medium. Fig. 10 shows the pressure drop inside the sand pack during the seawater injection that was carried out after the emulsion injection. As indicated in Fig. 10, it can be observed for all emulsions that pressure drop increases until the breakthrough and then decreases with some fluctuations, while, there was no fluctuation before the breakthrough. In fact, before the breakthrough, water in oil emulsion is only formed at the last section of the sand pack, which governs the system’s pressure drop and requires a high-pressure drop for movement in the porous medium. As the saturation of injected water increases, the relative permeability of water in oil emulsion decreases. For this system, emulsion’s relative permeability reduction overcome the increase in water saturation, which has a much lower viscosity and requires a higher pressure drop for movement. The maximum pressure drop occurs at the breakthrough where the injected water phase extends a dispersed path which results in the reduction of the pressure drop with considerable fluctuations. After the injection of one pore volume, the pressure drop fluctuates around a stabilized pressure. Emulsion viscosity and interfacial tension are not expected to affect the fluid flow behavior significantly . Therefore, in those solutions containing larger droplets, the emulsion droplets trap easily in the pore throats, which causes a higher pressure drop. In fact, in the injection of iron oxide nanofluid (with a considerable number of large droplets), there are a number of droplets that tend to be in bulk or conjoined form. The formation of larger droplets can restrict more pore throats in the porous medium. Various factors increase pressure drop in a porous medium. In the nanofluid injection scenario, an increase in pressure drop occurs due to the formation of W/O emulsion. The emulsion formed by the presence of the iron oxide nanoparticles closes the throat. Pore throat closure causes an increase in pressure. If oil finds no way to produce, the pressure drop will increase steadily. After about 200 minutes in the nanofluid injection scenario W/O emulsion is trapped and as a result, the pressure drop increases. Interfacial tension is also a fundamental factor that influences pressure drop and oil recovery during emulsion flooding. As Alvardo et al. reported, oil and water elasticity decrease with the increase of brine salinity during water flooding. On the other hand, interfacial elasticity reduces the chance of oil trapping by snap-off mechanism, which reduces pressure fluctuations. In this situation, the surface continuity increases considerably, which leads to easy movement of the oil. Therefore, during seawater injection into a seawater-based emulsion, the pressure drop in the sand pack is far less. The emulsion consisting of iron oxide nanoparticles has a higher pressure drop at breakthrough because it has more emulsion droplets and also larger droplets. Therefore, oil droplet trapping is much more than that of seawater emulsion. It should be noted that at the end of flooding, some throats that are full of water in oil emulsion, are bypassed by brine and remains a residual emulsion in the pore throats. Therefore, Sor is the residual emulsion saturation. The effect of the emulsion drops size distribution (more precisely, the emulsion drop size to pore size ratio) is expected to be the dominant mechanism of oil recovery in the presence of emulsion in the porous medium. In addition to the formation and stability of the emulsion, the degree of wettability alteration and asphaltene precipitation changes the oil recovery. Titanium oxide nanoparticles remove the oil film from the rock surface and alter the wettability by overcoming the disjoining pressure. The oil recovery is improved as a result of a more water-wet condition induced by nanoparticles. That’s why each of the nanoparticles had a different performance. Authors also sincerely thank Mrs. Sanaz Shojaee, manager of Shiraz EOR research center at Shiraz University, and Mr. Hossein Rezvani and Mr. Hamid Garmsiri for their collaboration in this work. 1. Orea, M., Bruzual, J., Diaz, A., Castillo, J., Árraga, T., & Benitez, N. (2015). Studies on EOR Emulsion Characterization: A systematic approach to assist In-Situ Combustion Operations. In Paper HOLA Presented at the Heavy Oil Latin American (HOLA) Conference Held in Bogotá, Colombia. 2. Xu K, Zhu P, Tatiana C, Huh C, Balhoff M. A Microfluidic Investigation of the Synergistic Effect of Nanoparticles and Surfactants in Macro-Emulsion Based EOR. SPE Improved Oil Recovery Conference: Society of Petroleum Engineers; 2016. 3. Yang F, Tchoukov P, Pensini E, Dabros T, Czarnecki J, Masliyah J, et al. Asphaltene Subfractions Responsible for Stabilizing Water-in-Crude Oil Emulsions. Part 1: Interfacial Behaviors. Energy & Fuels. 2014;28(11):6897-904. 4. Kar T, Williamson M, Hascakir B. The Role of Asphaltenes in Emulsion Formation for Steam Assisted Gravity Drainage (SAGD) and Expanding Solvent - SAGD (ES-SAGD). SPE Heavy and Extra Heavy Oil Conference: Latin America: Society of Petroleum Engineers; 2014. 5. Yang F, Tchoukov P, Dettman H, Teklebrhan RB, Liu L, Dabros T, et al. Asphaltene Subfractions Responsible for Stabilizing Water-in-Crude Oil Emulsions. Part 2: Molecular Representations and Molecular Dynamics Simulations. Energy & Fuels. 2015;29(8):4783-94. 6. Qiao P, Harbottle D, Tchoukov P, Wang X, Xu Z. Asphaltene Subfractions Responsible for Stabilizing Water-in-Crude Oil Emulsions. Part 3. Effect of Solvent Aromaticity. Energy & Fuels. 2017;31(9):9179-87. 7. White A, Kaiser A. Breaking Produced Emulsions of an Alkaline Surfactant Polymer Flood. SPE Symposium: Production Enhancement and Cost Optimisation: Society of Petroleum Engineers; 2017. 8. Ma H, Sultan AS, Shawabkeh R, Nasser MS. Destabilization and Treatment of Produced Water-Oil Emulsions Using Anionic Polyacrylamide with Electrolyate of Aluminum Sulphate and Ferrous Sulphate. Abu Dhabi International Petroleum Exhibition & Conference: Society of Petroleum Engineers; 2016. 9. Harbottle D, Chen Q, Moorthy K, Wang L, Xu S, Liu Q, et al. Problematic Stabilizing Films in Petroleum Emulsions: Shear Rheological Response of Viscoelastic Asphaltene Films and the Effect on Drop Coalescence. Langmuir. 2014;30(23):6730-8. 10. Tchoukov P, Yang F, Xu Z, Dabros T, Czarnecki J, Sjöblom J. Role of Asphaltenes in Stabilizing Thin Liquid Emulsion Films. Langmuir. 2014;30(11):3024-33. 11. Al-Anssari S, Wang S, Barifcani A, Iglauer S. Oil-Water Interfacial Tensions of Silica Nanoparticle-Surfactant Formulations. Tenside Surfactants Detergents. 2017;54(4):334-41. 12. Katepalli H, Bose A, Hatton TA, Blankschtein D. Destabilization of Oil-in-Water Emulsions Stabilized by Non-ionic Surfactants: Effect of Particle Hydrophilicity. Langmuir. 2016;32(41):10694-8. 13. Gao F, Xu Z, Liu G, Yuan S. Molecular Dynamics Simulation: The Behavior of Asphaltene in Crude Oil and at the Oil/Water Interface. Energy & Fuels. 2014;28(12):7368-76. 14. Kamal MS, Hussein IA, Sultan AS. Review on Surfactant Flooding: Phase Behavior, Retention, IFT, and Field Applications. Energy & Fuels. 2017;31(8):7701-20. 15. Seemeyer, S., Morrison, E. D., Scharrenbach, S., de Schneck, C. C., Küpper, S., & Rich, P. (2014). U.S. Patent No. 8,716,200. Washington, DC: U.S. Patent and Trademark Office. 16. Hutin A, Argillier J-F, Langevin D. Mass Transfer between Crude Oil and Water. Part 1: Effect of Oil Components. Energy & Fuels. 2014;28(12):7331-6. 17. Tichelkamp T, Teigen E, Nourani M, Øye G. Systematic study of the effect of electrolyte composition on interfacial tensions between surfactant solutions and crude oils. Chemical Engineering Science. 2015;132:244-9. 18. Hutin A, Argillier J-F, Langevin D. Mass Transfer between Crude Oil and Water. Part 2: Effect of Sodium Dodecyl Benzenesulfonate for Enhanced Oil Recovery. Energy & Fuels. 2014;28(12):7337-42. 19. Marques EF, Silva BFB. Surfactants, Phase Behavior. Encyclopedia of Colloid and Interface Science: Springer Berlin Heidelberg; 2013. p. 1290-333. 20. Gallaire F, Brun PT. Fluid dynamic instabilities: theory and application to pattern forming in complex media. Philosophical Transactions of the Royal Society A: Mathematical, Physical and Engineering Sciences. 2017;375(2093):20160155. 21. Aman ZM, Haber A, Ling NNA, Thornton A, Johns ML, May EF. Effect of Brine Salinity on the Stability of Hydrate-in-Oil Dispersions and Water-in-Oil Emulsions. Energy & Fuels. 2015;29(12):7948-55. 22. Sugiyama, Y., Sato, T., & Shoji, K. (2017). U.S. Patent No. 9,539,554. Washington, DC: U.S. Patent and Trademark Office. 23. Hirasaki GJ, Miller CA, Raney OG, Poindexter MK, Nguyen DT, Hera J. Separation of Produced Emulsions from Surfactant Enhanced Oil Recovery Processes†. Energy & Fuels. 2011;25(2):555-61. 24. Mandal A, Samanta A, Bera A, Ojha K. Characterization of Oil−Water Emulsion and Its Use in Enhanced Oil Recovery. Industrial & Engineering Chemistry Research. 2010;49(24):12756-61. 25. Garti N, Aserin A, Tiunova I, Binyamin H. Double emulsions of water-in-oil-in-water stabilized by α-form fat microcrystals. Part 1: Selection of emulsifiers and fat microcrystalline particles. Journal of the American Oil Chemists’ Society. 1999;76(3):383-9. 26. Matsumoto S, Kita Y, Yonezawa D. An attempt at preparing water-in-oil-in-water multiple-phase emulsions. Journal of Colloid and Interface Science. 1976;57(2):353-61. 27. Strassner JE. Effect of pH on Interfacial Films and Stability of Crude Oil-Water Emulsions. Journal of Petroleum Technology. 1968;20(03):303-12. 28. Schacht S, Huo Q, Voigt-Martin IG, Stucky GD, Schuth F. Oil-Water Interface Templating of Mesoporous Macroscale Structures. Science. 1996;273(5276):768-71. 29. Beattie JK, Djerdjev AM. The Pristine Oil/Water Interface: Surfactant-Free Hydroxide-Charged Emulsions. Angewandte Chemie International Edition. 2004;43(27):3568-71. 30. Levine S, Bowen BD, Partridge SJ. Stabilization of emulsions by fine particles I. Partitioning of particles between continuous phase and oil/water interface. Colloids and Surfaces. 1989;38(2):325-43. 31. De Gennes PG, Taupin C. Microemulsions and the flexibility of oil/water interfaces. The Journal of Physical Chemistry. 1982;86(13):2294-304. 32. Tajmiri, M., & Ehsani, M. R. (2016). The Potential of ZnO Nanoparticles to Reduce Water Consuming in Iranian Heavy Oil Reservoir. Journal of Water and Environmental Nanotechnology, 1(2), 84-90. 33. Barkhordari, V., & Jafari, A. (2018). Experimental Investigation of the Base Fluid Miscibility Condition on the Oil Recovery Using Nanofluids Flooding. 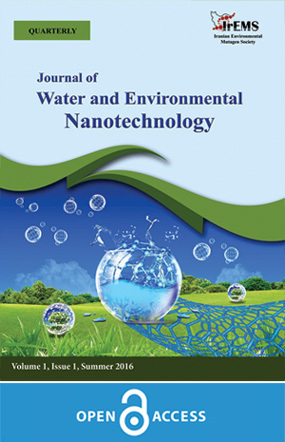 Journal of Water and Environmental Nanotechnology, 3(1), 12-21. 34. Crossley S, Faria J, Shen M, Resasco DE. Solid Nanoparticles that Catalyze Biofuel Upgrade Reactions at the Water/Oil Interface. Science. 2009;327(5961):68-72. 35. Saleh N, Sarbu T, Sirk K, Lowry GV, Matyjaszewski K, Tilton RD. Oil-in-Water Emulsions Stabilized by Highly Charged Polyelectrolyte-Grafted Silica Nanoparticles†. Langmuir. 2005;21(22):9873-8. 36. Zhang T, Davidson D, Bryant SL, Huh C. Nanoparticle-Stabilized Emulsions for Applications in Enhanced Oil Recovery. SPE Improved Oil Recovery Symposium: Society of Petroleum Engineers; 2010. 37. Sharma T, Kumar GS, Chon BH, Sangwai JS. Thermal stability of oil-in-water Pickering emulsion in the presence of nanoparticle, surfactant, and polymer. Journal of Industrial and Engineering Chemistry. 2015;22:324-34. 38. Amarfio EM, Aborisade O, Mohammed S. Effects of Nano-Particles (AL, AL2O3, CU, CUO) in Emulsion Treatment and Separation. SPE Nigeria Annual International Conference and Exhibition: Society of Petroleum Engineers; 2013. 39. Al Otaibi FM, Kokal SL, Chang Y, AlQahtani JF, AlAbdulwahab AM. Gelled Emulsion of CO-Water-Nanoparticles. SPE Annual Technical Conference and Exhibition: Society of Petroleum Engineers; 2013. 40. McElfresh PM, Holcomb DL, Ector D. Application of Nanofluid Technology to Improve Recovery in Oil and Gas Wells. SPE International Oilfield Nanotechnology Conference and Exhibition: Society of Petroleum Engineers; 2012. 41. Pi G, Mao L, Bao M, Li Y, Gong H, Zhang J. Preparation of Oil-in-Seawater Emulsions Based on Environmentally Benign Nanoparticles and Biosurfactant for Oil Spill Remediation. ACS Sustainable Chemistry & Engineering. 2015;3(11):2686-93. 42. Kim I, Worthen AJ, Johnston KP, DiCarlo DA, Huh C. Size-dependent properties of silica nanoparticles for Pickering stabilization of emulsions and foams. Journal of Nanoparticle Research. 2016;18(4). 43. Griffith N, Ahmad Y, Daigle H, Huh C. Nanoparticle-Stabilized Natural Gas Liquid-in-Water Emulsions for Residual Oil Recovery. SPE Improved Oil Recovery Conference: Society of Petroleum Engineers; 2016. 44. Kazemzadeh Y, Malayeri MR, Riazi M, Parsaei R. Impact of Fe3O4 nanoparticles on asphaltene precipitation during CO2 injection. Journal of Natural Gas Science and Engineering. 2015;22:227-34. 45. Moradi M, Kazempour M, French JT, Alvarado V. Dynamic flow response of crude oil-in-water emulsion during flow through porous media. Fuel. 2014;135:38-45. 46. Rezvani H, Khalilnezhad A, Ganji P, Kazemzadeh Y. How ZrO 2 nanoparticles improve the oil recovery by affecting the interfacial phenomena in the reservoir conditions? Journal of Molecular Liquids. 2018;252:158-68. 47. Rezvani H, Riazi M, Tabaei M, Kazemzadeh Y, Sharifi M. Experimental investigation of interfacial properties in the EOR mechanisms by the novel synthesized Fe 3 O 4 @Chitosan nanocomposites. Colloids and Surfaces A: Physicochemical and Engineering Aspects. 2018;544:15-27. 48. Kazemzadeh Y, Eshraghi SE, Riazi M, Zendehboudi S. How do metal oxide nanoparticles influence on interfacial tension of asphaltic oil-Supercritical CO 2 systems? The Journal of Supercritical Fluids. 2018;135:1-7. 49. Kazemzadeh Y, Shojaei S, Riazi M, Sharifi M. Review on application of nanoparticles for EOR purposes; a critical of the opportunities and challenges. Chinese Journal of Chemical Engineering. 2018.